UTC-Series products deliver aesthetically-designed, all-in-one touch panel solutions suitable for many applications including control room, production line, industrial digital signage, showroom interactive signage, self-service kiosks and public service terminals. They also fulfil many digital retail and hospitality service needs such as in healthcare, vending, eductation, entertainment and information handling. They are beautiful, durable, and reliable. The systems perform extremely well, with advanced touchscreen technology, wireless support, customized peripherals, rich I/O featues, protective covers and a full-range of installation accessories. Digital Out Of Home (DOOH) advertising is widely deployed in a range of fields such as retail, public transportation, education and hospitality, and has become an important part of the marketing landscape. 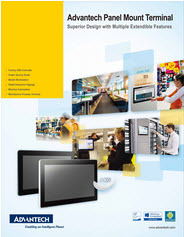 Implementing and planning sophisticated digital signage networks can be challenging, so Advantech has developed ready-made HW/SW signage solutions to help ease of deployment. Advantech’s turnkey signage solutions combine highly reliable platforms with application-ready software. All digital signage players come pre-loaded with an embedded OS, and at no extra cost, Acronis data protection, McAfee system security, and SUSIAccess Signage software. Advantech helps customers reduce complexity and capitalize on digital signage networks which means faster time-to-market and lower total cost of ownership.